We arrange many beautiful flowers in a vase and deliver in Vientiane, Pakse, Savannakhet. What better gift elaborated by creative professionals and require little maintenance, such as various types of colorful flowers arranged in a glass vase. Flower in a vase are perfect for the home or office decor. It is also the ideal gift for delivery to the hospital or to celebrate a new home, etc. There are a few reasons why the flowers in a vase is the better choice. Beautiful flowers arranged in a vase or container so that it can retain water. This will make it easier for the recipients. They don't have to worry about finding a suitable container to put flowers in later. We offer free delivery in Vientiane, Luang Prabang, Pakse, and Savannakhet city areas. 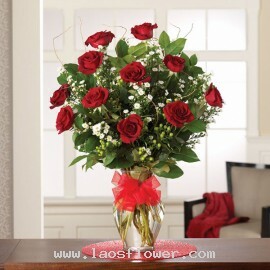 10 red roses arranged in a glass vase accents with red mickey mouse or white gypsophila flowers and green leaves. The vase wrapped with a bow. The color of roses can be replaced. Occasionally, substitutions may be necessary to create your bouquet due to the availability of certain flowers in vari..
10 long-stemmed white roses arranged in a clear glass vase accent with fern. We can add a bow. The color of roses can be changed. Please inform the staffs when ordering or email. Occasionally, substitutions may be necessary to create your bouquet due to the availability of certain flowers in vari..
A vase of 101 red roses accents with eucalyptus leaves and white gypsophila flowers and tied with red ribbon. The color of the roses and materials used for this vase can be changed. 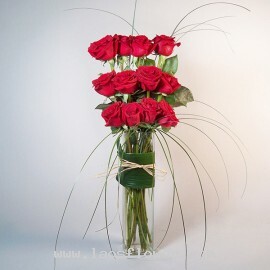 Occasionally, substitutions may be necessary to create your bouquet due to the availability of certain flowers in v..
12 long-stemmed red rose in a glass vase arrange in a third-level high-medium-low. Using 4 roses in a layer accent with leaves. Wrapped with leaves in the middle of a vase. This vase is perfect for a girlfriend or lover. To show your love send it on several occasions. 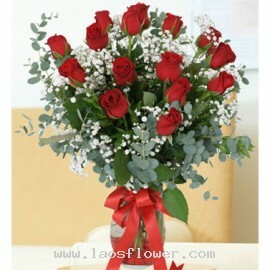 The color of roses can be chang..
12 long-stemmed red roses in a glass vase accent with lot of white gypsophila flowers. There is a free small card to go with this bouquet. The red card on the picture is not included in this product. * The vase can be decorated with a bow. 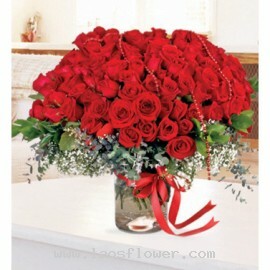 Occasionally, substitutions may be necessary to create yo..
A vase of 13 red roses arranged in a clear glass vase. * We will add a beautiful ribbon. The color of roses can be changed upon request when ordering or email right after placing an order. Occasionally, substitutions may be necessary to create your bouquet due to the availability of certain flowe..
14 assorted roses in a white ceramic vase consists of red, pink, orange, yellow, and champagne roses accents with green leaves. The color of roses can be changed, please advise when ordering or by e-mail. Occasionally, substitutions may be necessary to create your bouquet due to the availability ..
14 long-stemmed red roses arranged in a clear glass vase and tied with ribbon. The color of roses and ribbon can be changed to suit a theme or the color that you like. Occasionally, substitutions may be necessary to create your bouquet due to the availability of certain flowers in various parts o..
14 white roses arranged in glass vases. We can add a bow as a gift. Please choose the color of ribbon that you like. The color of roses can be changed. Occasionally, substitutions may be necessary to create your bouquet due to the availability of certain flowers in various parts of the country. 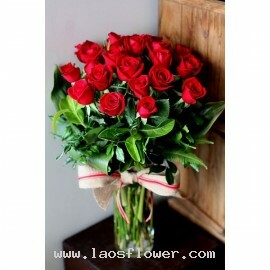 S..
A vase of 15 specially selected red roses. We will add a beautiful ribbon. * There are many roses colors to choose. They can be changed by notifying the staff when ordering. Occasionally, substitutions may be necessary to create your bouquet due to the availability of certain flowers in various p..
15 long-stemmed red roses in a vase accent with white gypsophila flowers and eucalyptus leaves. Adorned with a red bow tie. The color of flowers can be changed. Occasionally, substitutions may be necessary to create your bouquet due to the availability of certain flowers in various parts of the c..
A vase of 15 white roses accent with white gypsophila flowers at the bottom and tied with white ribbon. The color of flowers and ribbon can be changed as you wish. Occasionally, substitutions may be necessary to create your bouquet due to the availability of certain flowers in various parts of th..
16 sweet pink roses in a vase. The vase wrapped in pink paper and tied with white ribbon at the middle of the vase. 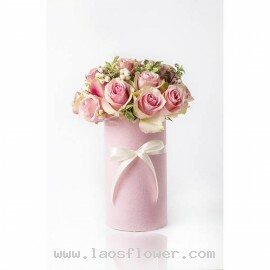 This bouquet is suitable for girls or to congratulations on a newborn baby girl. Customers can choose to send this vase with a small teddy bear. 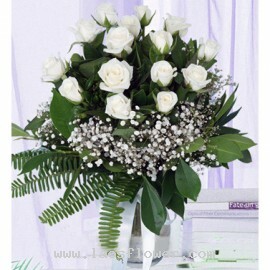 The color of roses and the materials us..
16 white roses arrange in round shape in a vase. 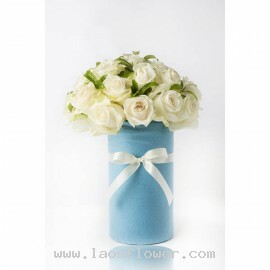 The vase wrapped in a light blue paper and tied with white ribbon in the middle of the vase. This bouquet is perfect for sending to your men or congratulations on the birth of new baby boy. You may choose to send with a cute little teddy bear. 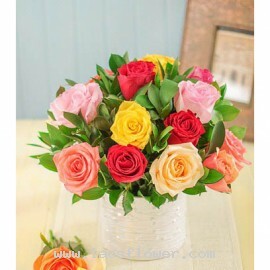 Th..
A vase of 18 assorted roses such as red, pink, white, yellow, orange etc. Adorned with a pink bow tie. * Excluding chocolate. The color of roses and bow can be changed. Occasionally, substitutions may be necessary to create your bouquet due to the availability of certain flowers in various parts ..
18 red roses arranged in a clear glass vase accents with purple caspia flowers. We will add a ribbon. The color of roses can be changed as you wish. Occasionally, substitutions may be necessary to create your bouquet due to the availability of certain flowers in various parts of the country. Subs..